The Chinese Zodiac Necklace make a fine reminder of your personal Chinese Zodiac connection. So whether you're a Chinese zodiac dragon, Chinese zodiac tiger, Chinese zodiac snake, Chinese zodiac dog, Chinese Zodiac Rat or just looking for information about the Chinese Zodiac 2019 information, even the Chinese zodiac calculator, and your Chinese Zodiac compatibility you've come to the right place. 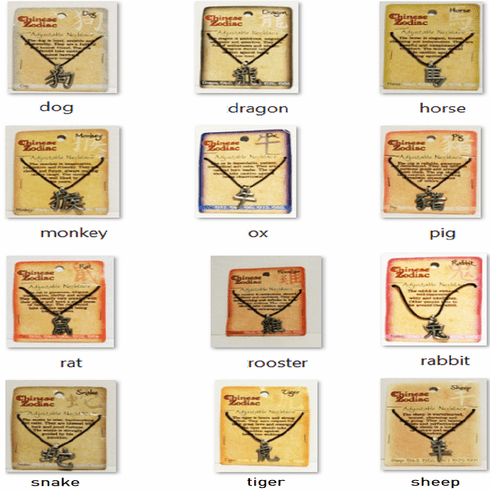 Each Chinese Zodiac adjustable necklace with its own unique Chinese character symbol. This jewelry item not intended to be used as a toy.